I went with my friend to the Wallowas. It was a date we had made a year before. Now, I had become a girl; though I wasn't out to the wide world yet, he understood the situation. I would be traveling as a woman. We talked all the way from Eugene to the Columbia River, where we slept in a motel (separate beds, if you must know), and talked all the way to Enterprise. I'm not not sure I had him convinced. I would characterize the conversation as interested, polite, with a bit held in reserve. He's a very, very strong personality. I had laid out a hike I thought was within our strength, and, he said, in effect, "bosh," and chose a much more strenuous route. I had misgivings, especially when the weather, which had held off all summer, rolled in. Beloved had said, "on this trip you will have to go as the wife." That proved to be key. In the past I would have struggled with him over what to do. Now, I simply followed his lead as the meek hiking companion lady. 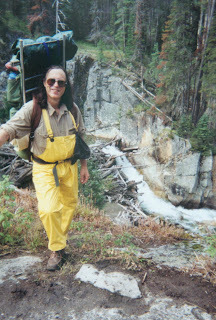 I discovered I was profoundly uncomfortable with hiking just now because it interefered with my newly constructed self-image: in man's clothing, with my old raingear and sunglasses, and my hair plastered down from the rain, showing the male-pattern baldness, I looked terribly male. The worst part was being so apparently flat-chested. It was depressing, and I kept up a cheeful patter whenever we were within earshot, to cover for it, which was not my true hiking style and we both knew it. We hiked about ten miles, found a wet meadow in which to pitch our little tents, and in the morning began the long climb up to the Five Lakes Basin, a second choice, as the loop route ahead of us had been clearly blocked overnight by fresh snow. We wouldn't be climbing the Matterhorn of the West on this trip. 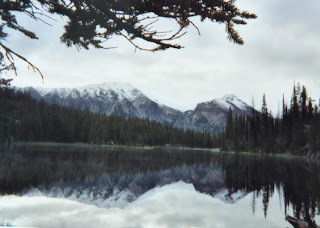 At the Basin we settled at Horseshoe Lake, an otherwise overused destination which, with the turn in the weather, we had all to ourselves. It was a magnificent setting, even with the low-running clouds, but I found myself concentrating on survival. My gear should be adequate to the conditions, but something about me had changed. Might the hormones be doing something to my resistance to cold? It was a dreadful night. 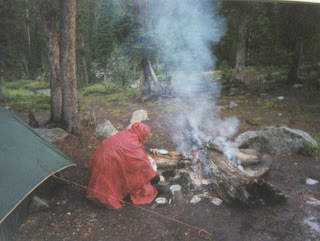 Snow fell constantly at 7,000 feet, then turned into slush and rain, raining on our tents at 6500. I had ditched adequately around my little high spot, and the rivulets ran past all night, but cold seeped into the sleeping bag and I slept little, if at all, wound tighter than a drumhead. At first light, I took my sheath knife and began a relentless exploration for dry wood. There were a number of dead lodgepole pines in the area, and these I stripped of bark on the east side, away from the weather. Making a small fire of cones and pine needles that I had found underneath a log, I piled on bark in the firepit until it was practically a bonfire, then dragged over two small logs and crossed them atop the flames. My friend awoke around nine a.m., having had a better night than I, but he, too, was glad of the fire. "How did you do that after it stormed all night?" "There's always dry wood if you look, my dear." He made oatmeal by the fire and offered me some, but I stuck to tea. "I'm not going to make it another night; something's wrong with my resistance and I'll need to get down from here." He nodded. "We're pretty evenly matched," he said. "I hold up to the cold better but you hike better. You're very strong and you cover ground. I putz along and find you eventually, but I can sit and admire things while you get all shivery." It was odd to hear these comparisons; it sounded like the male penchant for competition almost. On our way down out of the clouds, we met two young men coming up, and my friend stopped to chat with them awhile. I became aware of something new in my life; one of the men was attractive to me. He was a Quechua from Mexico with very brown skin, built like a gazelle, with exotic eyes, full of quiet self-assurance. They were discussing hiking with the adapted ski poles everyone uses now. I handed the young man my old hiking staff. "It's apple wood; a branch from one of my trees." I realized later I had done this to have him touch something of mine, so that some of his energy would stay with me. I don't think I had ever done such a thing before. The hike-out was fourteen miles. It was a strain, but reaching the car, we concluded we could make Grand Ronde by nightfall. The further we drove, the more sunshine and warmth we encountered. In town, my friend took me out to dinner. As we ate, he realized I hadn't wanted to leave the motel and that I had let him badger me. He became a bit morose, and this seems to be what he remembers of the trip; that it was melancholy. Like an era was passing. I was not the friend he had known, but someone new. He realized he hadn't been emotionally prepared for this, and it put him under a bit of a strain. My own memory of the trip is somewhat brighter. I went to the museums and restaurants that we discovered on our way home, very much in girl mode, and very successfully. I realized that if I could pass in Eastern Oregon then I had already come a long way. It would soon be time to come out at work.